In the 1980’s the ecosystem of Lake Victoria was subject to a thorough revision: within a relatively short period the Nile perch (Lates niloticus) became a dominant predator at the cost of many haplochromine cichlid species (Witte et al., 1992). As the vanishing haplochromine cichlids were all trophic specialists, their original food resources – among which algae, zooplankton and detritus – became abundant. As a consequence of this eutrophication, the allied turbidity lead to an overall reduction of the penetrating light and to a shift of its spectral composition towards the longer wavelengths (i.e. more reddish). The open water zooplanktivores disappearedalmostcompletely, but in the vicinity of rocky islands and in the shallow water regions several species managed to survive. The zooplanktivore Haplochromis tanaos has been exceptionable successful. This original inhabitant of the shallow waters of the Mwanza Bay has not only survived the ecological revolution, it has even expanded its habitat towards deeper regions. This raises two questions: what features made H. tanaos less vulnerable than its close relatives and how could this species even gain deep water? The major key to this problem may be found in a better adaptability to the altered visual sight. Presupposed that the haplochromine species flock was clearly adapted to the ambient light conditions – as confirmed by the comparison between retinas of several zooplanktivores (van der Meer et al., 1995), a change of the light regime would constrain their visual abilities. As cichlids are visually orientated fish (Fryer & Iles, 1972) these constraints include predator avoidance, prey detection and intraspecific communication (Guthrie & Muntz, 1993). Young haplochromine cichlids develop retinas designed for trichromatic vision: a regular mosaic of blue sensitive single cones surrounded by four unidentical red/green sensitive double cones, also called a square pattern (Otten, 1981, van der Meer, 1992). New cones are formed by cell division along the periphery of the retina (Powers & Raymond, 1990). During the life-long growth of the eyes, the square pattern may remain unaltered (Fernald, 1985). However, in many of the haplochromines, the single cones diminish or disappear completely in some retinal areas whereas the double cones reorient and become enlarged, thus increasing their photon catching ability (van der Meer et al. 1995). Within some species the potency to adapt to an ambient red shift may be stronger than in others. The retinas of fourteen adult specimens of the zooplactivorous cichlid Haplochromis tanaos, an endemic species from Lake Victoria ((van Oijen & Witte, 1996) were studied. Eight specimens were caught between 1978 and 1979 (old population). The other six specimens were caught in 2001 (new population). The fishes were caught during the day (light adapted) in the Mwanza Gulf and directly put on ice. After being fixed in 10% formalin they were sent to Leiden University. 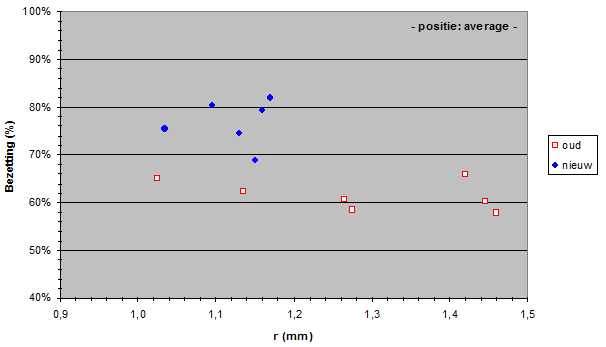 After measuring the Standard Length (SL, Barel et al., 1977) and the lens radius (r) in all specimens, the left eyes were isolated, dehydrated and embedded in paramat. 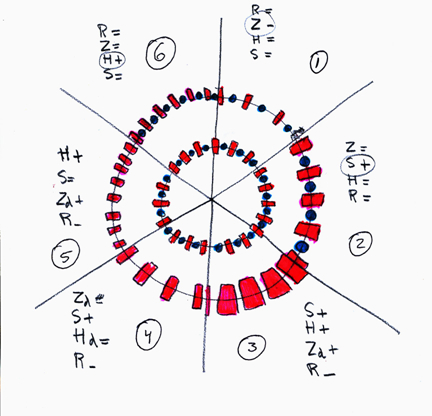 Tangential sections ((5μm) were made at 12 different locations of the retinas of each eye using a technique described in Van der Meer & Anker (1986). The ventro-caudal located falciform process was used as verification. All sections were deparafined and stained with haematoxylin and eosin. On the level of the cone ellipsoids pictures were taken using a Nikon Coolpix. With the aid of UTHSCSA Image Tool, version 1.28 several morphological features of the cones were measured and calculated: the mean size of the double cones (Sd), the ratio between the single and double cones, the number of double cones per unit area (density; Dd) and the fraction retinal area occupied by double cones (packing; Zd) were measured and calculated on each location in each eye. These data enabled accurate mapping of cone size, density and packing in each retina. 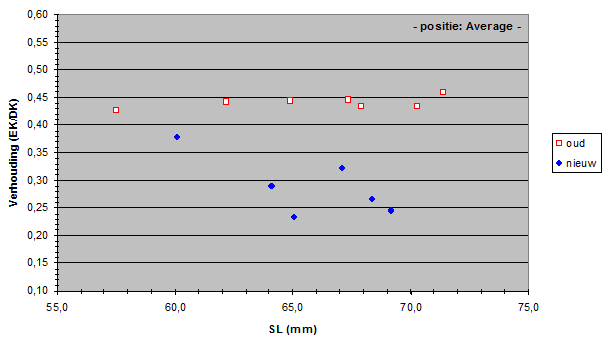 where 2.55 * r represents Matthiessen’s ratio (Sivak, 1982) which approximates the image distance in the eye. All data were transported into Excel (Microsoft Excel 2000) and analysed with SPSS (Windows version 10.0; Huizingh, 1999). The Statistic tests we used in order to compare the old and the new populations were the parametric General Linear Model and the non-parametric Mann-Whitney test (Buijs, 1994). In most fish the adults have much larger eyes than the juveniles and the structural features of the retinas change during growth so that visual capacities are modified. (e.g. Fernald, 1991). Retinal structures including cones evolve from the peripheral margin with the exception of the rods, which develop throughout the retinal area between the cones (Powers & Raymond, 1990). The cones in juveniles are densely packed and still small. During growth newly formed cones are added from the margin, older cones grow larger while the retina stretches and – to some extend - the cone packing decreases. The reduced cone packing may benefit rod evolvement (Otten, 1981). Due to the isomorphic growth of the eyes the amount of light projected on the retina is not affected by the process (van der Meer & Anker, 1984). Enlargement of cones therefore increases their photon catching ability and lower the photopic threshold of that specific retinal area (van der Meer, 1994). The size of a photopic unit embracing some double cones surrounding a single cone (Otten, 1981; van der Meer, 1995) varies with the size and arrangement of the different cone types: units of similar size may include a large single cone surrounded by four double cones according to a square pattern or may include a parallel arrangement (row pattern) of four double cones and a minute or absent single cone (van der Meer, 1992). Since double cones are mainly sensitive for the longer wavelengths and single cones are primarily blue sensitive (van der Meer & Bowmaker, 1995; Bowmaker, 1995) the enlargement of double cones is understood as an increase of red-green sensitivity and a change in the ratio between double cones and single cones also indicates a shift in spectral sensitivity. As the eye grows larger the number of cones per visual angle usually increases. Presupposing that retinal wiring does not change, the angular cone density can serve as a measure for acuity. 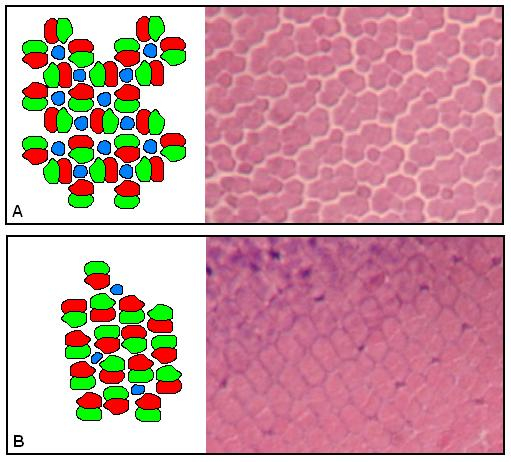 A change in angular density is therefore explained as a change of visual resolution. However, due to spatial constraints between cone size and cone density there is a trade-off between sensitivity and acuity (van der Meer & Anker, 1984; Barel, 1993). Visual differences between the old and the new population can be derived from the relationship between the retinal structures (size, density and arrangement of cones) and the eye size (lens radius) or from the relationship between the retinal structures and the standard length. The first approach is constructional in character and may give some information on the eyesight of the individual fishes. The second approach is more eco-functional in character and gives us an idea what visual features may have served the population to survive visual barrier due to eutrophication. 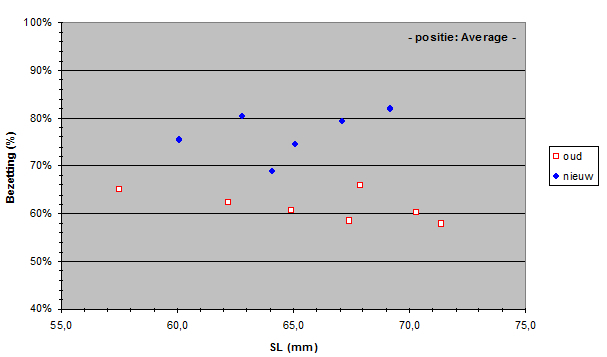 The Standard Lengths (SL) of the old population varied from 56,5 to 71,4 mm and SL of the new population varied from 59,5 to 69,2 mm. 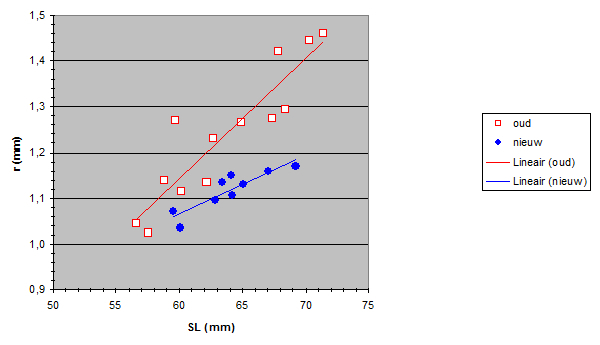 The measured lens radius (r) was plotted against SL in both populations. 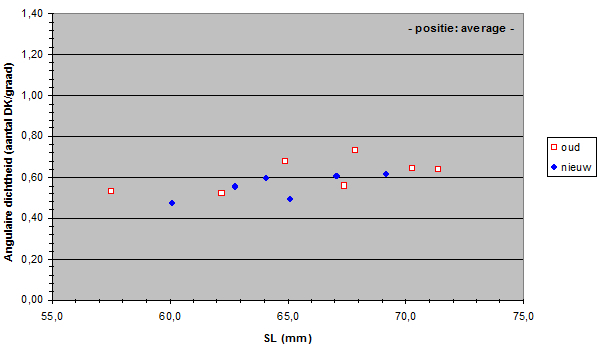 Due to a constant ratio between lens diameter and eye diameter (Matthiessen’s ratio; Sivak, 1982) the lens radius was a measure for eye size. Apparently the new population had relatively smaller eyes than the old population had. At first sight this is not an advantage as smaller eyes usually mean lesser visual abilities. Unless specific retinal changes have occurred as well (see below). The smaller eyes in the new population may be the result of a trade-off to provide space for one or more other structures in the head (Barel, 1993). For instance, one may expect larger gills in the new population to compensate the lower oxygen concentration in the lake since the eutrophication (Welten 2002). Besides, the jaw muscles may have become enlarged in order to process larger prey (Van Oijen & Witte, 1996). The size of the double cones (Sd) in the old population varied from 12,94 to 46,95 mm2 and Sd in the new population varied from 16,64 to 49,51mm2. In the rostral region of the retina no significant difference in the size of the double cones could be established. However, a significant enlargement of the double cones was found in other parts of the retina of the new population, especially in the caudal region. In general, one can say that the double cones have become larger in the new population. The double-cone density varied from 110 to 447 (per 104 mm2) in the old population and from 158 to 483 in the new population. 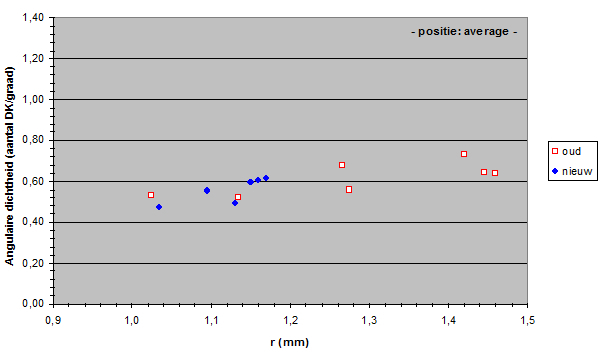 The double-cone density was plotted against the lens-radius (constructional approach) and against the standard length (eco-functional approach). 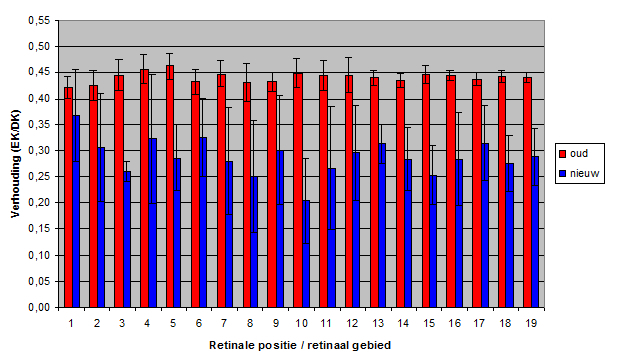 In most retinal areas no significant difference was found in a structural comparison of the old and the new population. The angular density of the double cones varied from 32.3 to 136 in the old population and from 32.1 to 92.4 in the new population. Only in the medial dorso-caudal (D30, C30) region a significant drop of angular density was found. Apparently, the mean angular density of the double cones (and consequently of the photopic units) had not changed during eutrophication. In general, the visual acuity (resolution) in the new population was not significantly different from the acuity in the old population. The zooplanktivore H. tanaos follows a saltatory search strategy andspirals towards its prey while it seems to refocus at intervals. So, the medial dorso-caudal region of its retina may serve in the detection of food particles. The lesser resolution in this region in the new population may indicate an increased difficulty in the detection of small prey which coincides with the findings of Van Oijen and Witte (1996). The packing of the double cones varied from 42.0 to 76.5 in the old population and from 62.3 to 91.0 in the new population. 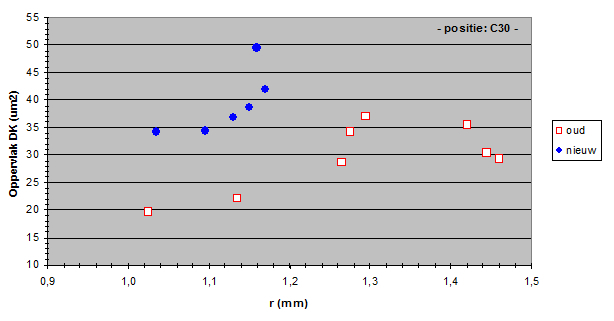 The mean packing was plotted against the lens radius and against the standard length. The packing was significantly larger in the new population in practically all retinal areas. 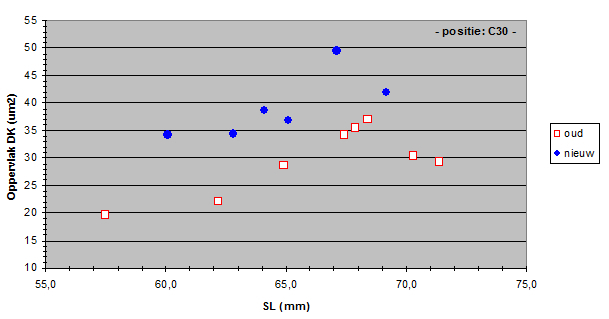 The general loss of single cones in the new population signifies the loss of trichromatic vision and a substantial reduction of blue sensitivity. Only in the dorso-caudal region of the retina the single cones maintained their position in square patterns. In this region blue sensitivity may have served as a trade-off for resolution. 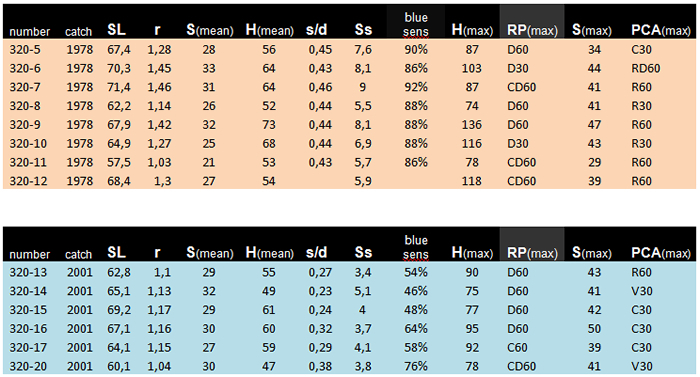 The general enlargement of double cones and photopic units in the new population indicate a lowering of the photopic threshold and an increase in red-green sensitivity. This coincides with the change in light regime due to eutriphication. Moreover, it serves the species to visualize a more obscure environment which may have enabled H. tanaos to extend its habitat to deeper water. The enlargement of double cones in the new population was especially found in those retinal areas where small double cones were arranged in a square pattern with a relatively low packing of double cones. Because of both the diminution of the single cones and a pattern change from square to diamond, the size and packing of the double cones could increase. This was mainly found in the periphery of ventral, caudal and dorsal regions of the retina. In the rostral and medial region the double cones of the old population were already relatively large. Besides, this region may contain the oldest cones, i.e. the cones that already were present in the juvenile’s retina. Only after many haplochromines become larger, they migrate to deeper water and grow in need of more accurate visual abilities. In a eutrophied environment this means an increase of sensitivity for longer wavelengths. As the eye grows, the stretching of the retina coincides with the addition of new cones from the periphery. It seems plausible that in the old population the greatest addition occurred where the cones remained smallest, i.e. in the ventral, caudal and dorsal region. Consequently, post-juvenile growth of the retina might especially occur in these regions and less in the rostral part of the retina. The relatively smaller eyes in the new population may indicate a lower rate of cell division (addition of new cones) which could be compensated by more stretching of the (double)cones during retinal growth. Since this process would mainly take place in the periphery of ventral, caudal and dorsal parts of the retina, this could explain why the greatest retinal differences between the old and the new population were mainly found in these regions. H. tanaos has adapted to the altered light regime of its eutrophied environment. The overall reduction of the penetrating light and the shift of its spectral composition towards the longer wavelengths is compensated by the enlargement of its double cones at the cost of its single cones. Consequently, it has lowered its photopic threshold, increased its long-wave sensitivity at the cost of its short-wave sensitivity and it maintained similar resolution (acuity) in spite of its smaller eyes. Comparative studies of haplochromine cichlid species show similar adaptations to various light conditions (Van der Meer et al., 1995). It is not yet clear to what extend the adaptations are induced by the environment (phenotypic plasticity) and to what extend they are genetically inherited. Probably some species are more plastic than others but on the other hand they maintain a genetic basis for plasticity as well. The adaptability of H. tanaos to the altered visual sight stands without question. If this alone has brought about the recovery of this species, is still uncertain. And a crucial question remains unanswered: species that have not recovered, were they unable to adapt to the altered light regime?